As I mentioned in the last post my self-imposed yarn diet turned out to be a complete bust. I just want it to be known though that although it looks like I went overboard, in reality 80% of the yarn I bought was on sale for dirt cheap. So cheap, it was practically free. Ok, that last part was for my benefit and was to help make me feel not so bad for bringing home even more yarn. But really, a lot of it was insanely cheap. It would've been wrong of me to not take advantage! 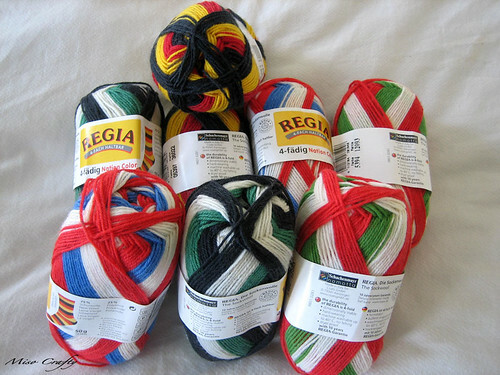 Take the Regia sock yarn, for instance. I've been wanting to get my hands on some Nation Color sock yarn ever since I laid eyes on the "it" sock of the moment, Skew. But alas, this collection came out ages ago and a skein is hard to come by. I'm still searching high and low for the rainbow colorway (that's Regia Nation Color in colorway #5399, for those that would like to find some for me, or would like to donate some from their own stash. Hey, I gotta try, right?). The last time I was in Dressew they only had the smallest aisle of yarn that offered nothing but acrylic novelty yarn. Nothing to get excited about. This time around I discovered that the front half of the upper floor was dedicated to yarn! And surprisingly there was some good stuff and some good brands. In the last aisle that I checked out was the Regia. Imagine my surprise to find some of the yarns I covet in Dressew! Such a random and weird find, indeed! If my tiny squeal of delight and little happy dance wasn't enough to creep some people out, then my overly excited squawk (yes, I squawked!) must have done the trick when I discovered just how much each skein was going for. Get this: $1.99 per skein. I kid you not. So of course I stocked up! 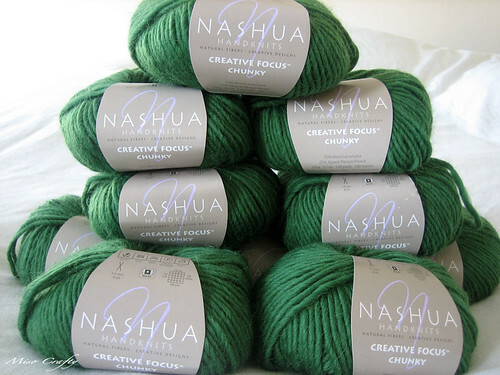 I also picked up enough Nashua Handknits CFC to make a sweater with. In particular, the Sedum cardigan. I've been wanting to knit this pattern up for a while now but could never find a chunky yarn in a color I would want to wear. 'Til now. On my quick jaunt to Three Bags Full I scored another sweet deal. 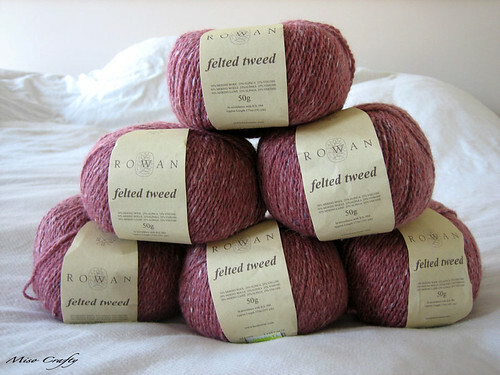 Some Rowan Felted Tweed in a very pretty shade of pink! Absolutely perfect. Especially since I'm currently on a tweed phase and because the colorway was being discontinued it was on sale for 30% off. At $7 a ball it would've been stupid of me to not scoop some up! They only had 8 balls left and I took home 6 cause the other 2 were of different dye lots and were quite obviously different. I'm really hoping that I've got enough for a sweater or cardigan. If not, I'm pretty short with T-Rex arms, so I think I can save some yardage by making my sleeves 3/4 length. Yay for being petite? This wasn't on sale, but it's so gorgeous that I need to blog about it! I got it from Three Bags Full. It's from a relatively new yarn company (well, it's new to me!) 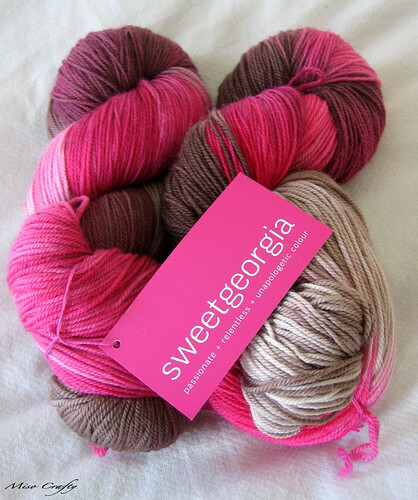 called SweetGeorgia Yarns. They are a Vancouver company that are all about intense and fierce color. The color that I got is called Boheme that features surprise, surprise, hot pink and chocolate brown. Although I was very tempted to get the Lakeshore Drive or Rusted colorway, but only had 1 skein in stock left of both. When I got home I checked out the website and got all excited that they offer both a yarn and fiber club. I've always wanted to try out a club but most are for a year subscription and I'm not sure if I can commit to a club for that long, solely cause I'm not sure how many skeins I'll actually use/like and in the end would be worth the cost. SweetGeorgia is offering 3 month long subscriptions, which would be perfect for my hesitant mind. 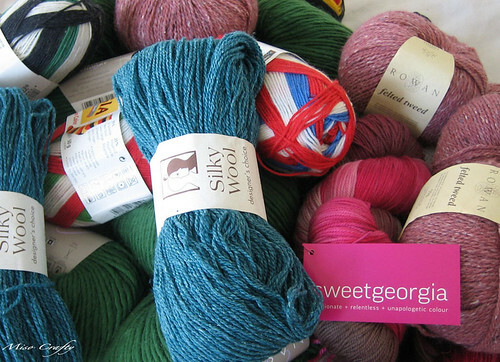 Hmmm...I wonder if I could persuade one of my Vancouver friends to pick up the yarn for me at the SG studio once a month? The price difference is HUGE between local pickup and actual shipping. So, any takers?? (Insert huge smile and eyebrow raises). Anyways, with so much yummy yarn in the house I should really get cracking and either get some projects finished or knit faster. I don't see the latter happening any time soon, so I think I should get cracking. So on that note, Happy Knitting Yarn Lovers! PS: There's only 2 days left of my May Day Giveaway! So don't forget to enter! !